Clarissa Holcombe was the daughter of Bethuel Holcombe and Clarissa Fuller. [S25] Hannah McPherson, Holcombe Genealogy, Page 119.1/Item A-8-1-1-13-5-4. Theodore Dwight Hayes married Louisa Holcombe, daughter of Bethuel Holcombe and Clarissa Fuller, on 30 November 1830. Samuel Wells married Ruth Judson, daughter of Joseph Judson and Sarah Porter. Ruth Judson married Samuel Wells. Ruth Judson was born on 27 October 1664. She was the daughter of Joseph Judson and Sarah Porter. Ruth Judson died on 2 May 1744 at age 79. [S94] Nathaniel Goodwin, Genealogical Notes, or Contributions to the Family History of Some of the First Settlers of Connecticut and Massachusetts, Page 139. Samuel is a descendant of Governor Thomas Welles in the line of his son Samuel. Samuel Welles was born Novemberr 11, 1766. He was the son of John Welles and Hannah Curtis. Samuel Welles married Anna Griswold, daughter of Ozias Griswold and Anna Stanley, on 19 April 1787 at Wethersfield, Hartford Co., CT. Samuel Welles died in 1816. Anna Griswold was born on 12 September 1762 at Wethersfield, Hartford Co., CT. She was the daughter of Ozias Griswold and Anna Stanley. Anna Griswold married Samuel Welles, son of John Welles and Hannah Curtis, on 19 April 1787 at Wethersfield, Hartford Co., CT. Anna Griswold died on 15 September 1828 at age 66. [S116] Esther Griswold French and Robert Lewis French, Griswold, Page 358/Item 286. John Welles was the son of Wait Wells and Jerusha Treat. Wait Wells was the son of Capt. Thomas Wells. Capt. Thomas Wells was born on 14 February 1693. He was the son of Capt. Samuel Wells and Ruth Rice. Capt. Thomas Wells died on 14 May 1767 at age 74. [S94] Nathaniel Goodwin, Genealogical Notes, or Contributions to the Family History of Some of the First Settlers of Connecticut and Massachusetts, Page 258. Capt. Samuel Wells was born on 13 April 1660 at Wethersfield, Hartford Co., CT.2 He was the son of Hon. & Capt. Samuel Welles and Elizabeth Hollister. Capt. Samuel Wells married Ruth Rice on 20 June 1683. Capt. Samuel Wells died on 28 August 1731 at Glastonbury, Hartford Co., CT, at age 71.2 He left a will on 29 June 1733. Manwaring 3:127. [S394] CG Barbara J. Mathews, Thomas Welles, Page 10. Manwaring 3:473 f. Ruth Rice married Capt. Samuel Wells, son of Hon. & Capt. Samuel Welles and Elizabeth Hollister, on 20 June 1683. Ruth Rice left a will on 9 September 1741. She died on 30 March 1742. Hon. & Capt. Samuel Welles was born in 1630 at England. He was the son of Gov. Thomas Welles and Alice Tomes. Hon. & Capt. Samuel Welles married Elizabeth Hollister, daughter of Lt. John Hollister and Joanna Treat, in 1659. Hon. & Capt. Samuel Welles died on 15 July 1675. 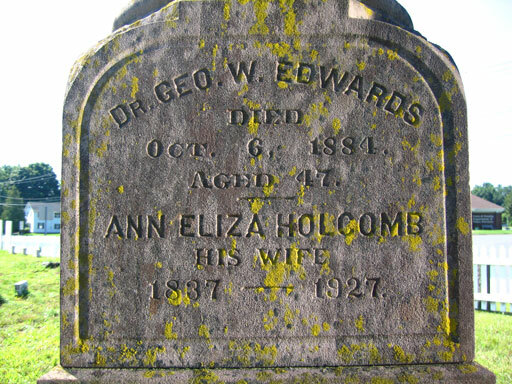 Ann Eliza Holcombe was born in 1837. She was the daughter of Edmund A. Holcombe and Mabel Wells. Ann Eliza Holcombe married Dr. George W. Edwards. Ann Eliza Holcombe died in 1927. [S164] Carol Laun, Holcombe Collection, Page 38. [S25] Hannah McPherson, Holcombe Genealogy, page 150.1. [S161] Carol A. Laun, Granby Center Cemetery, Page 70. Milton and Alvira were enumerated in the 1860 Granby, Hartford Co., CT, census with their children. Rufus and Clarissa were enumerated in the 1850 Granville, Hampden Co., MA, federal census. He was a farmer, age 37, she was 40. Children in the household were Margaret 12, and James H. 7. Also in the household was Deborah Barlow, 75. Lucy Gillett was born on 17 April 1786. She was the daughter of Deacon Samuel Gillett. Lucy Gillett married Silas Holcombe, son of Elijah Holcombe and Lucy Holcombe, on 26 November 1807. Lucy Gillett died at Southwick, Hampden Co., MA. Silas Holcombe III was born on 17 December 1808 at Southwick, Hampden Co., MA.2 He was the son of Silas Holcombe and Lucy Gillett. There is a Silas Holcombe, age 86, enumerated in the 1895 Iowa State Census, born CT. Also in the household was Eliza 76, born in NY, and Homer J. age 42, born in NY. [S25] Hannah McPherson, Holcombe Genealogy, Page 112.1/Item A-8-1-1-9-1-2-1. Eliza Holcombe was born on 30 March 1810 at Southwick, Hampden Co., MA.1 She was the daughter of Silas Holcombe and Lucy Gillett. Alonzo Holcombe was born on 4 December 1812 at Southwick, Hampden Co., MA.3 He was the son of Silas Holcombe and Lucy Gillett. Alonzo Holcombe married Lois Stone. Alonzo Holcombe married Mary Ellen Steele. 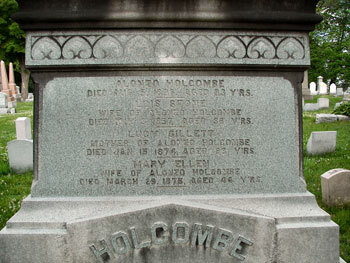 Alonzo Holcombe died on 5 August 1896 at age 83. Alonzo and Ellen were enumerated in the 1860 Henrietta, Monroe Co., NY, federal census. He was a farmer, age 46; she was 28. Children in the household were L. Emma, 18, Byron 16, Barton 14, Watson 12, Judson, 10, Carrie 6, Chester H. 4, and Charles 1; also in the household was (brother?) A. B. 45, a carpenter, and (mother?) Lucy, 73. [S25] Hannah McPherson, Holcombe Genealogy, Page 112.1/Item A-8-1-1-9-1-2-3. Byron Holcombe was born in 1815 at Southwick, Hampden Co., MA.2 He was the son of Silas Holcombe and Lucy Gillett. Byron Holcombe married an unknown person at AL. [S25] Hannah McPherson, Holcombe Genealogy, Page 113.1/Item A-8-1-1-9-1-2-4. Lucy Holcombe was born on 20 October 1820 at Southwick, Hampden Co., MA.2 She was the daughter of Silas Holcombe and Lucy Gillett. [S25] Hannah McPherson, Holcombe Genealogy, Page 113.1/Item A-8-1-1-9-1-2-5. Homer Holcombe was born in 1851. He was the son of Silas Holcombe III. Lois Stone was born circa 1819. She married Alonzo Holcombe, son of Silas Holcombe and Lucy Gillett. Lois Stone died on 3 May 1857. Emma Lucy Holcombe was born on 25 September 1841 at Henrietta, Monroe Co., NY. She was the daughter of Alonzo Holcombe and Lois Stone. Emma Lucy Holcombe married Charles Cooke at Lockport, Niagara Co., NY. [S25] Hannah McPherson, Holcombe Genealogy, Page 112.1/Item A-8-1-1-9-1-2-3-1. Killed in Battle of Antietam, Civil War. Byron Stone Holcombe was born on 24 September 1843 at Henrietta, Monroe Co., NY. He was the son of Alonzo Holcombe and Lois Stone. 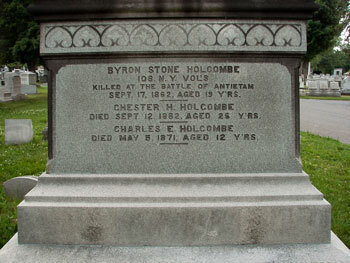 Byron Stone Holcombe died on 17 September 1862 at Civil War, Antietam, Sharpsburg, MD, at age 18. [S25] Hannah McPherson, Holcombe Genealogy, Page 112.1/Item A-8-1-1-9-1-2-3-2. 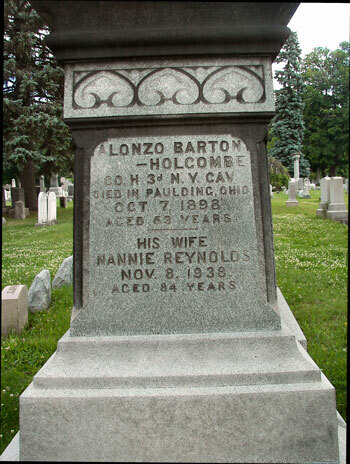 Alonzo Barton Holcombe was born on 25 May 1845 at Henrietta, Monroe Co., NY. He was the son of Alonzo Holcombe and Lois Stone. Alonzo Barton Holcombe married Nannie Reynolds on 28 January 1875 at Lancaster, Lancaster Co, PA. Alonzo Barton Holcombe died on 21 October 1898 at Paulding, OH, at age 53. [S25] Hannah McPherson, Holcombe Genealogy, Page 112.1/Item A-8-1-1-9-1-2-3-3. Watson Dewey Holcombe was born on 18 January 1847 at Henrietta, Monroe Co., NY. He was the son of Alonzo Holcombe and Lois Stone. Watson Dewey Holcombe married Lavinnia Jones on 24 December 1867 at Henrietta, Monroe Co., NY. Watson Dewey Holcombe was a member in 1926 at Holcombe Reunion, Philadelphia, Philadelphia Co., PA. He died on 20 May 1927 at Henrietta, Monroe Co., NY, at age 80. He was buried at Maplewood Cemetery, Henrietta, Monroe Co., NY. Farmer in Henrietta, NY; attended the Holcombe reunion in Philadelphia, 1926. Alonzo and Lavinnia were enumerated in the 1870 Henrietta, Monroe Co., NY, federal census. He was a farmer, age 22, she was 21. The only child in the household was Frederick 1. Also in the household was Harvey J. 21. Additonal information on the descendants of Watson is from Cheri Holcombe, callcheri@aol.com. [S25] Hannah McPherson, Holcombe Genealogy, Page 112/Item A-8-1-1-9-1-2-3-4. Harvey Judson Holcombe was born on 6 September 1848 at Henrietta, Monroe Co., NY. He was the son of Alonzo Holcombe and Lois Stone. Harvey Judson Holcombe married Fannie Frost White on 25 February 1880 at West Brighton, NY. Harvey Judson Holcombe died on 6 September 1928 at West Brighton, NY, at age 80. He was buried at Mt. Hope Cemetery, Rochester, Monroe Co., NY. [S25] Hannah McPherson, Holcombe Genealogy, Page 112.2/Item A-8-1-1-9-1-2-3-5. Carrie Eliza Holcombe was born on 10 May 1854 at Henrietta, Monroe Co., NY. She was the daughter of Alonzo Holcombe and Lois Stone. Carrie Eliza Holcombe died in 1920 at Rochester, Monroe Co., NY. She was buried at Mt. Hope Cemetery, Rochester, Monroe Co., NY. [S25] Hannah McPherson, Holcombe Genealogy, Page 112.2/Item A-8-1-1-9-1-2-3-6. Chester Holcombe was born on 2 June 1856 at Henrietta, Monroe Co., NY. He was the son of Alonzo Holcombe and Lois Stone. Chester Holcombe died on 12 September 1882 at age 26. Mary Ellen Steele was born circa 1831. She married Alonzo Holcombe, son of Silas Holcombe and Lucy Gillett. Mary Ellen Steele died on 29 March 1875. Charles E. Holcombe was born on 9 March 1859. He was the son of Alonzo Holcombe and Mary Ellen Steele. Charles E. Holcombe died on 5 May 1871 at age 12. Frank Byron Holcombe was born on 1 January 1869 at Henrietta, Monroe Co., NY. He was the son of Alonzo Holcombe and Mary Ellen Steele. McPherson typos birth date as 1889, Seaver shows 1869. Fannie Ellen Holcombe was born on 3 September 1872 at Henrietta, Monroe Co., NY. She was the daughter of Alonzo Holcombe and Mary Ellen Steele. Fannie Ellen Holcombe married Herman Gaylord Remage on 3 February 1897. Fannie Ellen Holcombe died in 1944 at Rochester, Monroe Co., NY. She was buried at Mr. Hope Cemetery, Rochester, Monroe Co., NY. [S25] Hannah McPherson, Holcombe Genealogy, Page 113.1/Item A-8-1-1-9-1-2-3-10. Charles Cooke married Emma Lucy Holcombe, daughter of Alonzo Holcombe and Lois Stone, at Lockport, Niagara Co., NY. Nannie Reynolds was born on 28 June 1854 at Lancaster, PA. She married Alonzo Barton Holcombe, son of Alonzo Holcombe and Lois Stone, on 28 January 1875 at Lancaster, Lancaster Co, PA. Nannie Reynolds died on 8 November 1938 at age 84. Mary Reynolds Holcombe was born on 1 September 1881 at Paulding, OH. She was the daughter of Alonzo Barton Holcombe and Nannie Reynolds. Mary Reynolds Holcombe died on 10 July 1967 at St. Louis, St. Louis Co., MO, at age 85. [S25] Hannah McPherson, Holcombe Genealogy, Page 112.2/Item A-8-1-1-9-1-2-3-3-1. Lavinnia Jones was born on 5 November 1848. She married Watson Dewey Holcombe, son of Alonzo Holcombe and Lois Stone, on 24 December 1867 at Henrietta, Monroe Co., NY. Lavinnia Jones died on 27 November 1927 at age 79. Frederick Watson Holcombe was born on 17 June 1870 at Henrietta, Monroe Co., NY. He was the son of Watson Dewey Holcombe and Lavinnia Jones. Frederick Watson Holcombe died on 19 December 1901 at age 31.